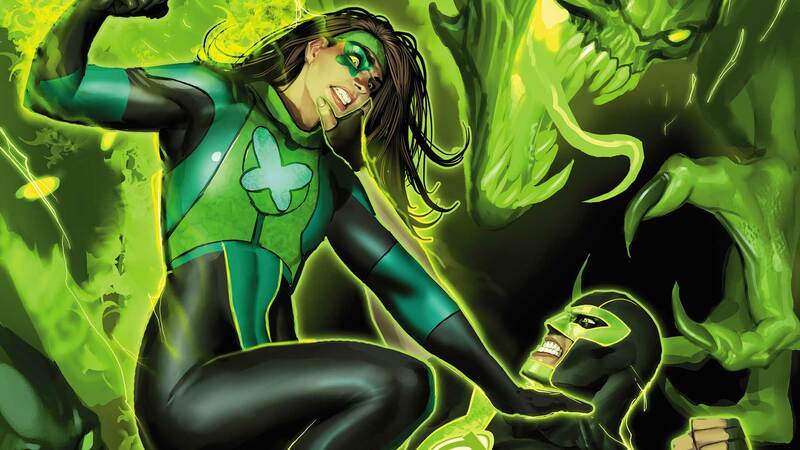 Turns out Jessica Cruz was just an appetizer. So far in “Ghosts of the Past,” the revelatory GREEN LANTERNS storyline that dives into Jessica’s surprising history, we’ve learned that she was once an avid outdoorsman and hunter who was struck with crippling agoraphobia and social anxiety after witnessing a murder that then led to the deaths of her closest friends. The only problem is that confronting that brutal past may just lead to her impending demise at the hands of Singularity Jain, the extraterrestrial fugitive who literally lives off of the pain of others. She’s long had her eye on Jessica, who seems dangerously close to falling into the trap that Jain has set. Can Jessica’s partner, Simon Baz, get to her in enough time to rescue her? Maybe not, as our exclusive sneak peek of issue #47 suggests. As Simon nears Jessica, the black hole that had opened above Portland seems to…well, you’ll have to read it to find out. But for once it doesn’t look like the Justice League will be able to save the day. GREEN LANTERNS #47 by Tim Seeley, V. Ken Marion, Sandu Florea and Dinei Ribeiro is in stores this Wednesday.